Recent hurricanes like Maria and Sandy have brought crippling winds, torrential rains, and flooding to vulnerable coastal regions, in some cases killing thousands of people. 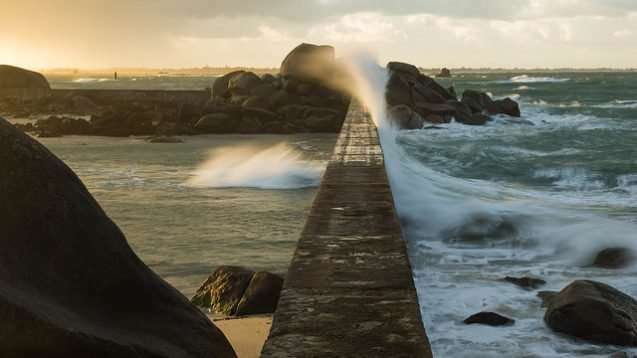 Sea walls and other barriers are often suggested as a way of protecting these low-lying coastal communities, but how large should such a wall be, and where is the most effective place to build it? At Columbia's Earth Institute, a team of environmental scientists and researchers is trying to answer these questions and more, to help curb the devastation from future hurricanes. "One of the things we're probably going to focus on is the specific scenario of a sea-wall around Lower Manhattan—where to put that wall, and how high it needs to be are two of the variables we'll be looking at," said lead researcher Kyle Mandli, an Earth Institute affiliate and assistant professor of applied mathematics at Columbia University's School of Engineering and Applied Science. A storm surge barrier is just one of several protection strategies for coastal communities—including artificial reefs, infrastructure elevations, and even managed retreat—that Mandli and his associates intend to investigate as part of the endeavor. Currently, Mandli and Columbia mathematics and engineering professor Daniel Bienstock are running simulations that anticipate how storm surge and sea level rise will impact NYC's infrastructure under existing conditions over the next approximately 50 years. The scientists will then introduce into these models interventions such as a sea-wall, restored wetlands, or artificial sand dunes to hypothesize how, and to what extent, the damages from future hurricanes can be prevented. The team's objective is to come up with a multi-pronged proposal that would minimize storm-related damage as much as possible. "The optimal thing would be to have a suite of measures designed to work in concert to protect the coastline," said Mandli. Using openly available New York City data, the scientists are mapping the footprints and critical elevation levels of all the buildings and infrastructure of Manhattan's varied streetscape—including hospitals, subway entrances, and fire stations—with the goal of predicting how future hurricanes will impact communities at large. "No one has really thought about the entire area with everyone included—all the agencies and all pieces of infrastructure, like the hospitals, the schools, the underground transportation system," said Earth Institute faculty member George Deodatis, chair of Columbia's Department of Civil Engineering and Engineering Mechanics. The scientists are also taking into account the costs of such resiliency measures. Typically, every dollar spent on protection reduces damage-related financial losses by five to ten dollars. And, since it is often difficult to secure large amounts of government funding for coastal interventions, Mandli's team may recommend a gradual installation of equipment every 30 years or so as new funds become available. Besides, worsening storm and sea level rise conditions may trigger the need for more protection as the years pass, he noted. "We may only need a 5-foot wall now," said Mandli, "but in 30 years, maybe we would need a 10-foot wall." To better understand the real-world effects of hurricanes on the different neighborhoods of southern Manhattan, the team is collecting input from state, city, and local officials. The findings from these outreach efforts—led by the National Center of Atmospheric Research (NCAR), a partner in the project—are supposed to help guide the team's storm surge modeling. So far, NCAR staff members Rebecca Morss and Heather Lazrus, the project's co-principal investigators, have interviewed about a dozen leaders of the New York City and New York State Offices of Emergency Management and other government agencies. These officials have shared their views on the needs and vulnerabilities of their communities—explaining, for instance, how institutions such as hospitals depend on the power grid during emergencies, and offering recommendations on how to lessen risks from storm surge. The team's approach of collecting the officials' responses and revising the scientific models and simulations accordingly is a crucial element of the project's success, according to Mandli. "The idea is, we have all these numerical and computational techniques of storm surge barriers – but if we just rely on those, we're going to get an answer that might not be indicative of the true situation," he explained. "It is important for us to talk to people who are actually making the decisions and who understand the potential impact of storm surge on the ground," said Lazrus. Morss and Lazrus plan to hold community meetings in select neighborhoods of the city next summer in order to gather local residents' input and concerns as well. The project is funded until 2019, thanks to a grant from the National Science Foundation's Critical Resilient Interdependent Infrastructure Systems and Processes program. If the team can secure additional funding to extend the project until 2023 or 2024, Mandli and his colleagues will explore storm protection strategies for other U.S. coastal cities such as Tampa Bay, Miami, Houston, or New Orleans. To further their goal of broadening the project's impact, the scientists have made their simulation software open-source and thereby available for use to anyone in the private or public sectors. "The real intent here is try to provide this capability as broadly as possible, so that it's applicable to anywhere in the world," said Mandli. We may only need a 5-foot wall now, but in 30 years, maybe we would need a 10-foot wall. The 160 year trend averages 2.84 mm per year, though it has slowed considerably since 2009. It would take 536 years for sea levels to rise 5 feet. They won't be needing a 10 foot sea wall for at least a thousand years. You would think climate scientists would base their suggestions on measurements of the real world. You would be wrong. They love their computer simulations because they can tweak them to create much more "interesting" (alarming) scenarios. Manhattan was already flooded by Hurricane Sandy, so your graph has already been superseded by real events. And if you look closely at your graph, you'll see that the data was not only averaged over a month, but also an average annual cycle was removed from that. Your graph can in no way depict extremes, which are when flooding is expected. Shame, shame.